Recent commercial satellite imagery indicates a significant acceleration in excavation activity at the West Portal area since last viewed in early December 2013. The size of the pile of spoil excavated from a new tunnel appears to have doubled in a period of a little over a month. Exactly what accounts for this acceleration remains unclear. However, it is unlikely Pyongyang intends to use this tunnel for its next nuclear test since two other tunnels in the Southern area of the site appear complete. Because the Southern area is often covered in shadows during the winter, coverage by commercial satellites can prove to be spotty. 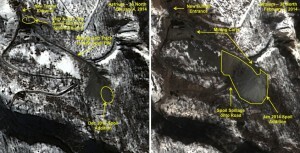 As a result, it was not possible to view the tunnel entrances in the most recent February imagery. A marked increase in overall activity at the central support area and roads leading to the test tunnel. Based on the most recent satellite imagery, there are no signs that a test is in preparation. Recent commercial satellite imagery indicates a significant increase in excavation activity at a new still incomplete tunnel to be used for a future nuclear test in the West Portal area. As previously discussed at 38 North, excavation of this new tunnel was first detected in May 2013 and continued throughout the year. Imagery from February 3, 2014 shows that the spoil pile—consisting of debris from excavation—apparently doubled in size from what was done during all of 2013. (Mining carts can be seen on the tracks to the spoil pile.) In fact, spoil recently dumped onto the pile spilled on the access road to the portal requiring that it be cleared. Figure 1. Spoil pile growth in 2014. As of December 2013, the volume of spoil was estimated to be some 2000 cubic meters. Assuming a two meter wide by two meter tall tunnel that would allow sufficient access but still minimize the amount of digging required, that volume of spoil would have corresponded to 500 meters of tunnel. Since December 2013, and especially in January, digging was accelerated and the spoil pile area appears to have doubled again, implying yet another 500 meters of tunnel dug. It must be recognized, however, that satellite imagery estimates are often imprecise because the depth of the spoil pile can only be roughly estimated. If these estimates are correct, they represent a significant acceleration of North Korean efforts since the beginning of 2014 to complete excavation of this new tunnel. There may be a number of possible explanations including: 1) the tunnel may have become easier to excavate because the rock is softer or looser; 2) the North Koreans may be trying to make up lost time to meet the tunnel’s scheduled date for completion; or 3) Pyongyang has decided to accelerate work in order to complete the tunnel ahead of schedule. Is a Test in the Works? In addition to the tunnel under excavation at the West Portal area, North Korea appears to have two completed tunnels at the South Portal area that could be used for a nuclear test if Pyongyang decided to conduct one. 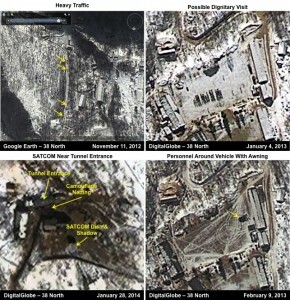 When last viewed in early December 2013 there were no signs of test preparations, although it is likely a test could be prepared in 1-2 months once the order is given by Pyongyang. According to press reports, South Korean Minister of Defense Kim Kwan-jin recently stated that the North appears ready to conduct another test although there are no signs that a blast is imminent. That assessment appears correct, although in the most recent February image, the entrances to the two completed tunnels in the South Portal area are in a deep shadow, as they will be for much of the winter, making it difficult to determine if any activity is taking place there. The North Koreans appear to have deployed camouflage netting to conceal activities at the tunnel entrance itself during preparations for a blast. A satellite communications dish for relaying data off-site was present in the weeks prior to the February 2013 detonation and then removed ten days before the blast. A similar dish was present before the 2009 test in the vicinity of the test tunnel. A special vehicle covered by an awning and surrounded by many personnel whose purpose was unclear was present in the central support/staging area on February 9, 2013, just four days before the detonation. There was a marked increase in overall activity at the central support area and roads leading to the test tunnel in the weeks before the February 2013 blast. Such activity would be expected if North Korea were preparing for a detonation. As of the most recent satellite imagery there are no signs that a test is in preparations. Figure 2. Preparation indicators for the February 2013 nuclear test.